Is your family ready for a disaster? Some of the most important things you and your family can do to be prepared for a disaster is to have an Emergency Supply Kit in your home and have and rehearse an Emergency Communication Plan for your family. Complete change of clothing including a long-sleeved shirt, long pants, and sturdy shoes and consider additional clothing if you live in a cold-weather climate. This list should be adapted to suit your personal family needs. You should also consider having at least two emergency supply kits, one full kit at home and a smaller, portable kit in your workplace or vehicle. Choose an emergency contact person, a friend or family member that lives in another city or state. Get that person’s cell, home and work numbers and email address. In the event that family members are separated during a disaster, everyone should call the emergency contact person and check in. Draw the floor plan of your home. Show the locations of exits (doors and windows) and map out escape routes, and practice exiting the building. Mark the locations of emergency supplies and utilities. In the case of a fire, choose a place outside of your home for your family to meet (mailbox, end of driveway, etc.). Choose a second meeting location outside your neighborhood in the event you cannot get back to your home. Enter all this information in everyone’s cell phone under “Contacts.” You can label it “Emergency Procedures.” Discuss your plan in detail with all of your family members to decrease confusion in the case of a disaster. 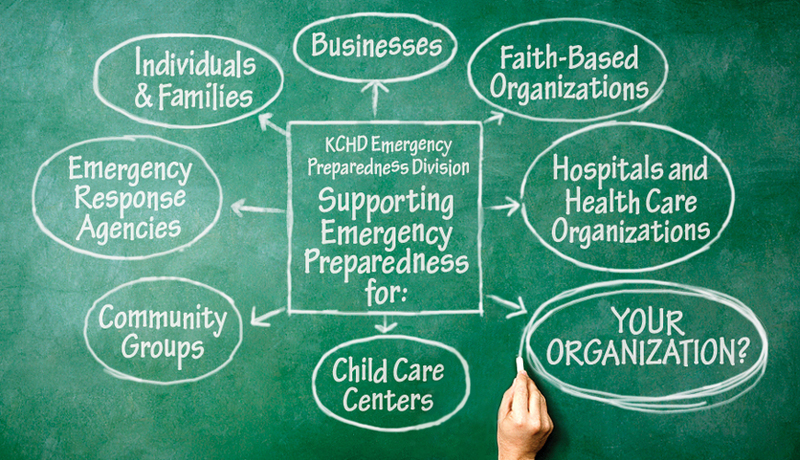 If you have questions or would like to speak to someone at the Knox County Health Department about Emergency Preparedness, please call 865-215-5093 or email health@knoxcounty.org. To stay informed of any emergencies or health threats in Knox County, follow the Knox County Health Department on Facebook and Twitter.